Did you miss hearing about crafts? I missed blogging about crafts! David and I have just returned from a trip to Tennessee where we went to visit his family. It was a lot of fun and I crafted a long the way! I will post photos in a blog post after this! David and I went to stay with his Uncle Jimmy, Aunt Karen and cousin, Heather. 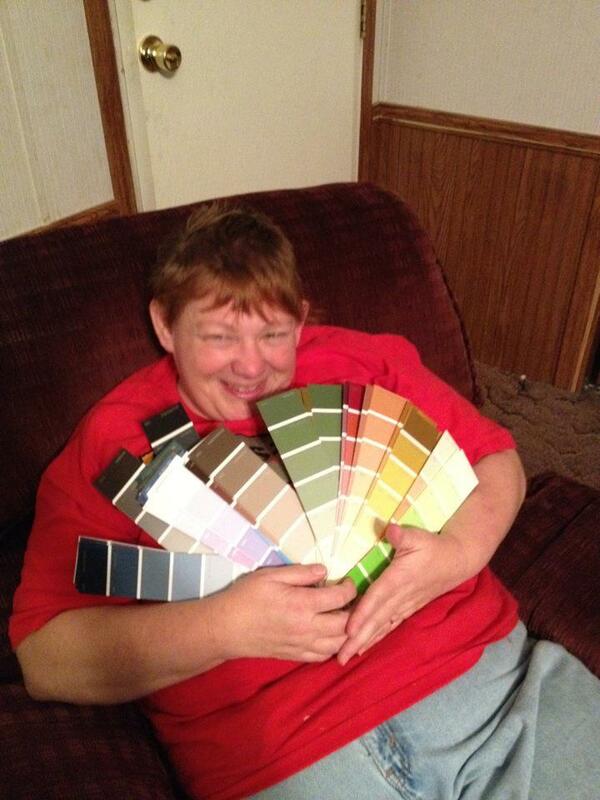 Aunt Karen told us how she wants to give their house a makeover. New paint, new carpet, etc. but how Uncle Jimmy wants the house to be paid for before they make it all new and fancy. He's been telling her, she can paint the house over his dead body. So when he went in for surgery she came to visit him at the hospital, swatches in hand. This did not comfort Uncle Jimmy. So,.....David and I went to Wal-Mart to get some last minute items (bottles of water, etc) for the trip home and we happened to be walking past the paint department. I grabbed color swatches that seemed Karen-like to me, when David suggested to get all of them. So we did. All 120 (give or take) and brought them back to Aunt Karen.